Guess how many ingredients are in that little hamburger patty you see there? No peaking at the recipe. If you said sixteen, you would be right! And I would be really impressed because I would never have guessed that you could get that many ingredients into one burger. Sixteen does not even count things like salt and pepper and all the extra fixings like lettuce and ketchup. When my husband suggested we make these Hemingway burgers for a July 4th cookout, I was very hesitant. How could that many ingredients taste good together? However, one taste and a bunch of happy dinner guests changed my mind. Somehow, all the flavors work together to make one delicious and unique burger. You might be wondering why these are called Hemingway burgers. Apparently, a recipe for these burgers was found among 2,500 Ernst Hemingway materials and papers that were digitized for the John F. Kennedy Presidential Library and Museum in 2013. You can see a scan of the original recipe in Saveur magazine. Hemingway notes that the burgers can include any number of other ingredients from minced mushrooms to cocktail sauce. I took his advice to heart and replaced minced ham with bacon because, as I have said before, bacon makes everything taste better. My husband and daughters also like to melt extra cheese on top their burgers because we are also big cheese lovers. You may be tempted to grill these burgers but I would advise against it. We grilled these the first time and found that the patties did not hold up well on the grill grates. They were still tasty; they just were not very pretty. The next time, I cooked them in a skillet as the original recipe states and it worked much better. Mix all the ingredients for the burger patties (ground beef through salt and pepper) in a medium bowl until everything is well mixed. Form the meat mixture into four hamburger patties or 8 smaller patties for sliders. Heat oil in a large skillet over medium-high heat. Gently place the patties in the skillet. Cook patties until cooked to desired doneness, 8–10 minutes, flipping once half way through. This may need to be done in batches. If desired, top patties with cheese and allow to melt before serving. 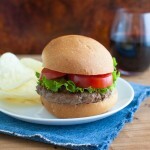 Serve on buns with lettuce, tomato, onion, ketchup, mustard, and mayonnaise as desired. Beau Monde seasoning is available in the spice aisle of most grocery stores. If you can’t find it, substitute in celery powder. 16 ingredients thats crazy! definitely need to try the recipe out.. i bet all the flavours taste amazing. Am puzzled where the Saveur version came from, as it is very different from the original. Anyone? I always thought the Saveur version came from the typed up recipe plus all the handwritten notes that were added like the apples, cheddar cheese, soy sauce etc.